Success in BNI is directly tied to each member being engaged in our system for success. 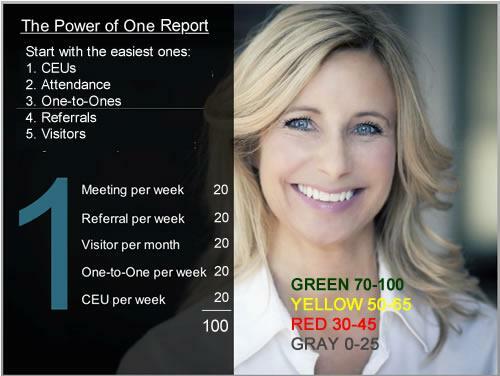 IT'S ALL ABOUT THE POWER OF ONE! Every(ONE) Chapter's Results are tied to the contributions of each member. That's why we track our activities every week in BNI...What Gets Measured, Gets Done! As we all work together to be our best, we want to recognize all of our members who are highly engaged in their chapters. Their ongoing commitment to their teams help to make their chapters more dynamic and their team members more successful. CONGRATULATIONS to the BNI Middle Tennessee, Kentucky, Southern Indiana region members who are GREEN (70 or more points) during May 2018 listed below.